About to buy a car I found on Oppo! 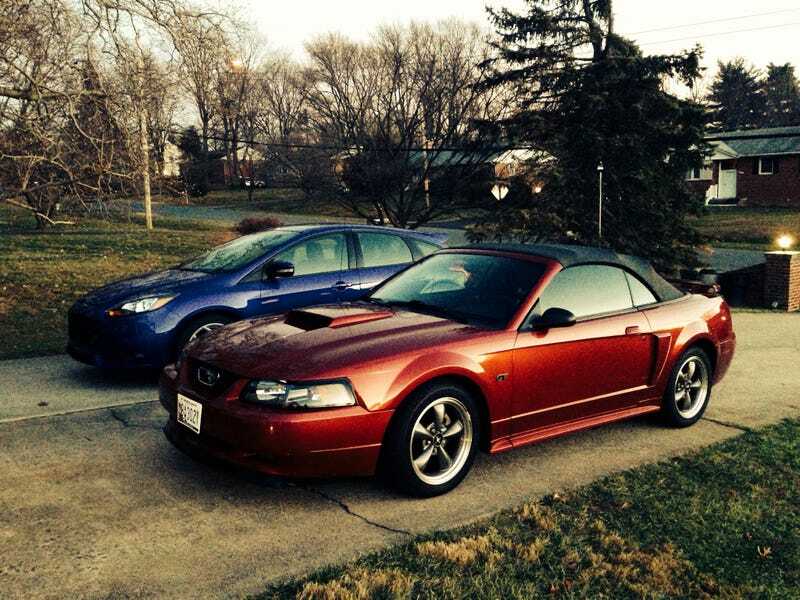 It is a 2003 Mustang GT convertible, exhaust, suspension, new tires, new headlights, great shape. And it all started on Oppositelock with a post. Just Listed My Mustang on Craigslist. I was sort of in the market already when I read it. The saga started in March 2013 when I posted "My $20,000 Challenge" on Oppo, one of my first articles. From there I wrote a Part 2 and passively searched for the right car. Moving into a new house this year, and all of the other things that go with it meant that my search stalled a bit and eventually I decided to drop my price range and go back to something I knew I would like, Mustangs. I have owned a 1993, 2003, 2010 and 2011 and the one from ten years ago always has a soft spot for me. I campaigned it for an entire autocross season in DC and won the Street Touring X class edging out a modified Mini with a much more veteran driver. It only had adjustable Koni's, H&R springs, and ok tires. People who ding the live rear axle and claim they don't handle well haven't tried. It's inexpensive and easy to improve the handling of an SN95 Mustang and I just found one that already had most of that done already. So with a new price range in mind, my search began anew when I saw the post by Brnrubber302 last Thursday. I reached out via Oppo and posted Going to look at a Mustang from Craigslist. Took a look on Sunday, went for a test drive on a 32 degree afternoon and was sold. Got the finances in order and will be departing for pick-up in 20 minutes! I will post again after the deal is done, pretty excited! I will give it a good home and it's future will be laid out in pictures on Oppo moving forward!